Welcome back to WCW where at PMA it means World Changing Women. When we last spoke I introduced you to Kasturba Gandhi, wife of the great Mahatma Gandhi. Rev. Dr. Martin Luther King, Jr. followed the teachings of Gandhi and applied them to the civil rights movement in the United States. There are so many correlations between Kasturba and Coretta from both being born in April, to marrying Civil Rights leaders, and sadly having their husband assassinated (though Kasturba proceeded Mahatma in death.) She was the face of strength after Dr. King died and worked tirelessly to get her husband’s birthday a national holiday. To date, Dr. King is the only black man to have a national holiday. 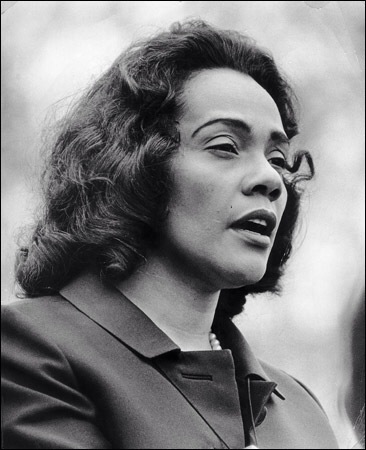 Coretta Scott was born April 27, 1927 in Marion, Alabama. Her father was the first black person in their neighborhood to own a truck. She was of mixed racial background with her paternal great-grandparents being slaves and both were of African-American and Irish descent. Coretta described herself as a tomboy during her childhood, primarily because she could climb trees and recalled wrestling boys. In addition, she also mentioned having been stronger than a male cousin and threatening before accidentally cutting that same cousin with an axe. His mother threatened her, and along with the words of her siblings, stirred her to becoming more ladylike once she got older. She saw irony in the fact that despite this early physical activities, she still was involved in nonviolent movements. The irony there is hilarious. Things were quite different back then and Martin Luther King, Sr. was worried that a “singer” was not a suitable wife for a Baptist minister. There was a great deal of back and forth about Martin being a good catch and Coretta’s family insisting that “She didn’t need to bargain for a husband.” Scott also realized that if she did marry King that also meant giving up ANY hopes of a career of her own. Despite all the obstacles on Valentine’s Day 1953 the couple announced their intention to marry in the Atlanta Daily Word. King Sr. who was not sold on Coretta continued to lobby for some nameless woman in Alabama, Jr. promised to get his doctorate and Sr. finally gave his blessing and even performed the ceremony. He wasn’t pleased that Scott had the vow to “obey her husband” removed, something that was unheard of at that time. The Kings became one on 18 June 1953. September of the following year the Kings moved to Montgomery, AL after Martin had accepted an invitation to be the pastor of Dexter Avenue Baptist Church. It wasn’t long before they found themselves in the Montgomery Bus Boycott and Martin was elected leader of the protest movement. It wasn’t far into the boycott that Coretta realized that this was a movement and it was bigger than her. On September 1, 1954, Martin Luther King, Jr. became the full-time pastor of Dexter Avenue Baptist Church. It was a sacrifice for Coretta, who had to give up her dreams of becoming a classical singer. Her devotion to the cause while giving up on her own ambitions would become symbolic of the actions of black women during the movement. 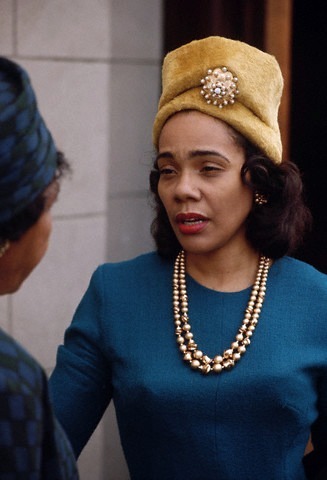 Coretta was the perfect compliment to her husband, singing in the choir and teaching Sunday school. During this time, Martin was constantly being arrested for the dumbest things imaginable.Most notably a sentence of 5 months hard labor for driving with an Alabama license while being a resident of Georgia; this just 3 days after being jailed and released for picketing in a department store. It was during this time that Robert F. Kennedy helped to get King released, although it would not be the last time her husband was imprisoned and Coretta would be fearful that her husband would be killed.The March On Washington, where the “I Have A Dream” speech was made is described by Scott King as, “It was as though heaven had come down.” The speech was a yawner, it was boring and Dr. King had actually lost the crowd. If you listen closely you will hear the booming voice of the great Mahalia Jackson yelling, “Tell them about the dream Martin!” The “Dream” was not a speech, it’s a recalling of an actual dream. It is what makes this one of the greatest speeches ever enunciated on the planet earth. Martin Luther King, Jr. was shot and killed in Memphis, TN on 4 April 1968. She learned of the shooting after being called by Jesse Jackson who was standing next to King when he was shot. 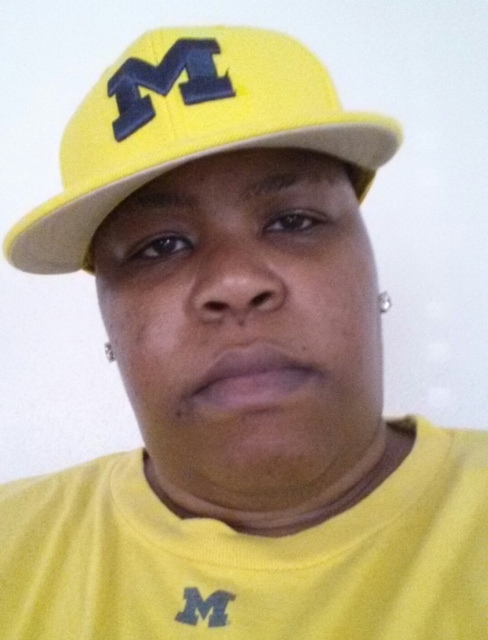 In an instant Mrs. King became a single mother of 4 and the love of her life was gone. Martin was in Tennessee to support striking garbage men when he was assassinated. Mrs. King struggled with how to tell their children that their father was not coming home. She even lied to them saying that he had just been badly hurt. On April 5, 1968, King arrived in Memphis to retrieve her husband’s body and decided that the casket should be kept open during the funeral with the hope that her children would realize upon seeing his body that he would not be coming home. In unprecedented valor and strength, she sat stoic and her strength was a symbol to the Black nation of what true strength was, at least that is what my father told me. Two days after his death, Coretta Scott King spoke at Ebenezer Baptist Church and made her first statement on his views since he had died. She said her husband told their children, “If a man had nothing that was worth dying for, then he was not fit to live.” Still visibly grief stricken she realized that although Martin was no longer here, that the fight was not over. She would go one and continue the civil rights work that she had done her entire adult life. In January 1969, King and Bernita Bennette left for a trip to India. Before arriving in the country, the two stopped in Verona, Italy and Mrs. King was awarded the Universal Love Award. King became the first non-Italian to receive the award. Mrs. King traveled to London with her sister, sister-in-law, Bernita and several others to preach at St. Paul’s Cathedral. Before, no woman had ever delivered a sermon at a regularly appointed service in the cathedral. On November 23, 1983 Ronald Regan signed legislation establishing Martin Luther King Day, in my opinion, it’s the only good thing Regan did during his entire administration. Coretta Scott King died on the late evening of January 30, 2006 from complications of advanced ovarian cancer, There are so many things that just couldn’t be said about her because I would be writing a book. I challenge you to seek out more information on this remarkable woman who fought apartheid and fought for equal rights for gays. Wherever there was injustice, Coretta Scott King was there also. She even defended Qubilah Shabazz who had been indicted for using telephones and crossing state lines in a plot to have Louis Farrakhan. Shabazz believes (as do I) that Farrakhan was involved in the assassination of her father, El Haj Malik Shabazz. King defended her, saying at Riverside Church in Harlem that federal prosecutors targeted her to tarnish her father’s legacy. El Haj Malik Shabazz is better known to the world as Malcolm X, this would not be the first or last time that the Shabazz (X) and King families would come into contact with one another. Betty Shabazz, Malcolm’s wife knew exactly what it was like to be married to a man that fought for civil rights. Betty also knew what it was to have her husband assassinated. Malcolm and Martin wanted the same thing, equal rights for Blacks in America. Martin wanted to achieve this through non violence, Malcolm said by ANY means necessary, and the two often clashed, but the wives never did. It’s no thing when it comes to bringing you some artistic, creative, and incredible scoops because Pardon My Audacity always brings the dopest news to you!Like what you read here: Subscribe to the blog! Follow us on Twitter: @PardnMyAudacity. Like our Facebook page. Follow us on IG: @PardonMyAudacity. TK’s Bio: Terrence Kyrell Hodge I was born 9/13/79, in what was then W. Berlin Germany, to Qualise and Lieutenant Tyrone Hodge of the United States Marine Corps. He lived inLondon England and graduated from the University of Michigan Ann Arbor in 2000 with BA in English and Political Science. Terrence writes about any and everything. Terrence is planning a series of novels that are works of “faction” part factual (nonfiction) and partly fictional. He plans to bring a dual vision of American and European observation and opinions to PMA. He will bring blunt honesty with a sense of comedy. He says “I will write wherever I’m needed as I am NOT a one trick pony.